We’ve had a blast of cold weather the past few days, but it didn’t deter our plans of going into the city this weekend, so I made sure to dress up nice and cozy. Good thing I picked up this quilted side zip top from Lane Bryant last week. I just loved the details on it. I bought it a bit over-sized so it’s really thick and comfy and feels more like a sweater. The LB website says the color is Madeira Red, but I say it’s more of a burgundy plum. So I paired it with an old colorful gap scarf I had, added a long layered necklace, and of course tall boots to complete my look. Love the rich plum colour, you look so cute. Very chic look. 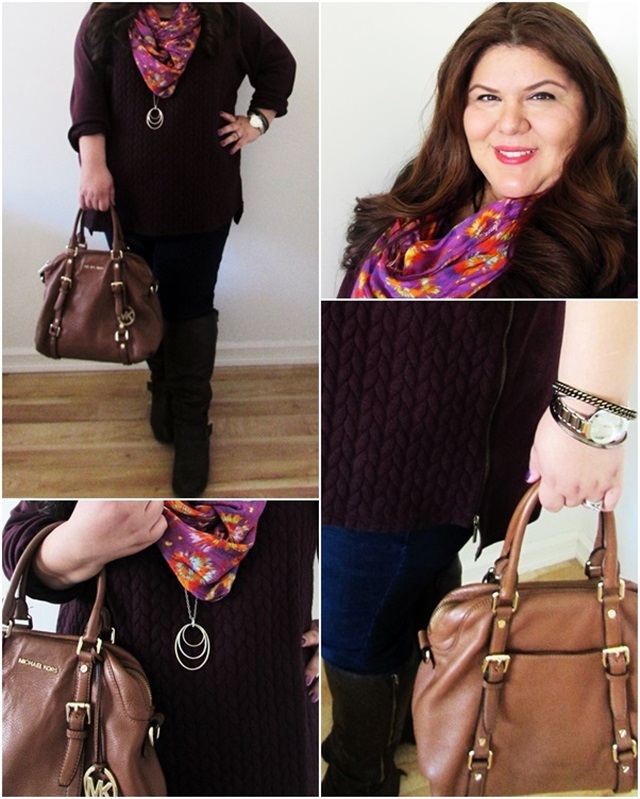 Love your purse and scarf. You look stunning I love the deep rich colors on you! arrgghh this is EXACTLY what i wish i was wearing today, its gone to 4 degrees Celsius here in the uk literally over night. This looks like the perfect warm and chic ensemble! Gorgeous Jenny!